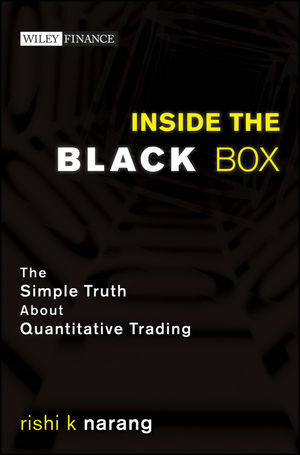 "In Inside the Black Box: The Simple Truth About Quantitative Trading, Rishi Narang demystifies quantitative trading. His explanation and classification of alpha will enlighten even a seasoned veteran." "Rishi provides a comprehensive overview of quantitative investing that should prove useful both to those allocating money to quant strategies and those interested in becoming quants themselves. Rishi's experience as a well-respected quant fund of funds manager and his solid relationships with many practitioners provide ample useful material for his work." "A very readable book bringing much needed insight into a subject matter that is not often covered. Provides a framework and guidance that should be valuable to both existing investors and those looking to invest in this area for the first time. Many quants should also benefit from reading this book." "Without complex formulae, Narang, himself a leading practitioner, provides an insightful taxonomy of systematic trading strategies in liquid instruments and a framework for considering quantitative strategies within a portfolio. This guide enables an investor to cut through the hype and pretense of secrecy surrounding quantitative strategies." ?Ross Garon, Managing Director, Quantitative Strategies, S.A.C. Capital Advisors, L.P.
"Inside the Black Box is a comprehensive, yet easy read. Rishi Narang provides a simple framework for understanding quantitative money management and proves that it is not a black box but rather a glass box for those inside." "This book is great for anyone who wants to understand quant trading, without digging in to the equations. It explains the subject in intuitive, economic terms." "Rishi Narang does an excellent job demystifying how quants work, in an accessible and fun read. This book should occupy a key spot on anyone's bookshelf who is interested in understanding how this ever increasing part of the investment universe actually operates." "Inside the Black Box provides a comprehensive and intuitive introduction to "quant" strategies. It succinctly explains the building blocks of such strategies and how they fit together, while conveying the myriad possibilities and design details it takes to build a successful model driven investment strategy." Rishi K Narang is the Founding Principal of Telesis Capital LLC, which invests in quantitative trading strategies. Previously, he was managing director and coportfolio manager at Santa Barbara Alpha Strategies. Narang cofounded and was president of Tradeworx, Inc., a quantitative hedge fund manager, from 1999–2002. He has been involved in the hedge fund industry, with a focus on quantitative trading strategies, since 1996. Narang graduated from the University of California at Berkeley with a BA in economics. Part One The Quant Universe. Chapter 1 Why Does Quant Trading Matter? The Benefit of Deep Thought. The Measurement and Mismeasurement of Risk. Chapter 2 An Introduction to Quantitative Trading. What is the Typical Structure of a Quantitative Trading System? Part Two Inside the Black Box. Chapter 3 How Do Quants Make Money? Types of Alpha Models: Theory-driven and Data-driven. Limiting the Amount of Risk. Limiting the Types of Risk. Chapter 5 Transaction Cost Models. Types of Transaction Cost Models. Chapter 6 Portfolio Construction Models. Output of Portfolio Construction Models. How Quants Choose a Portfolio Construction Model. High Frequency Trading: Blurring the Line between Alpha and Execution. Blueprint for Research: The Scientific Method. Part Three A Practical Guide for Investors in Quantitative Strategies. Chapter 10 Risks Inherent to Quant Strategies. Contagion, or Common Investor, Risk. Chapter 11 Criticisms of Quant Trading: Setting the Record Straight. Trading is an Art, Not a Science. Quants Cause More Market Volatility by Underestimating Risk. Quants Cannot Handle Unusual Events or Rapid Changes in Market Conditions. Quants are All the Same. Only a Few Large Quants Can Thrive in the Long Run. Quants are Guilty of Data Mining. Chapter 12 Evaluating Quants and Quant Strategies. Evaluating a Quantitative Trading Strategy. Evaluating the Acumen of Quantitative Traders. How Quants Fit into a Portfolio. Chapter 13 Looking to the Future of Quant Trading. ?Excellent new book . . . demystif[ies] the world of quant investing, and does so in a way that should be intelligible to any thoughtful investor. . . admirably thorough . . . and highly readable throughout. The book has a logical structure, which gradually builds an ever more complete picture of what it is that quants do, how they do it, and what the issues really are that surround quant trading. Much more than a simple "beginner's guide" to quants, and it really gets interesting in the final third, where [the author] looks in some detail at the risks inherent in quant approaches and the criticisms of quant trading?and how to evaluate them. To find out more about how to evaluate quants, read this book.? In "Inside the Black Box," Rishi Narang makes the impossible seem possible: he takes the vastly misunderstood role of the quantitative trading strategy and makes it understandable to those with only the most tenuous working knowledge of global capital markets. How he does so is a sleight of hand no more complicated than patient, consistently eloquent writing, and easy-to-understand, basic examples." "The book, Inside the Black Box: The Simple Truth About Quantitative Trading, by Rishi Narang, is hands down the best introductory book I've read on the topic. Narang does a brilliant job of explaining (in simple English), how and why quantitative trading works. If you are looking for a primer on Quantitative Trading I strongly endorse and recommend this book." "In a new book on quantitative trading strategies, entitled "Inside the Black Box: The Simple Truth About Quantitative Trading," Rishi Narang, founding principal of Telesis Capital, seeks to explain with real-world examples and anecdotes what it is exactly that quants do?The book focuses on a few major questions that Narang says are important to understanding the quant world. These include: what is a quant, what are the secrets of successful quant trading, what caused the disasters in quant trading, what role did quants play in the credit crisis, and what is the future of quant trading?" "You may be skeptical that Rishi Narang will be able to deliver on the ambitious promise of his book, Inside the Black Box: the Simple Truth about Quantitative Trading (published by John Wiley & Sons, 2009). But he does deliver. He tells you, in language that can be understood by most educated people, what a quantitative trading system is and what a quant does."